Facebook hasn’t made many friends among publishers lately. The company’s announcement that it would de-prioritise publishing content in its algorithm had many in the industry up in arms. 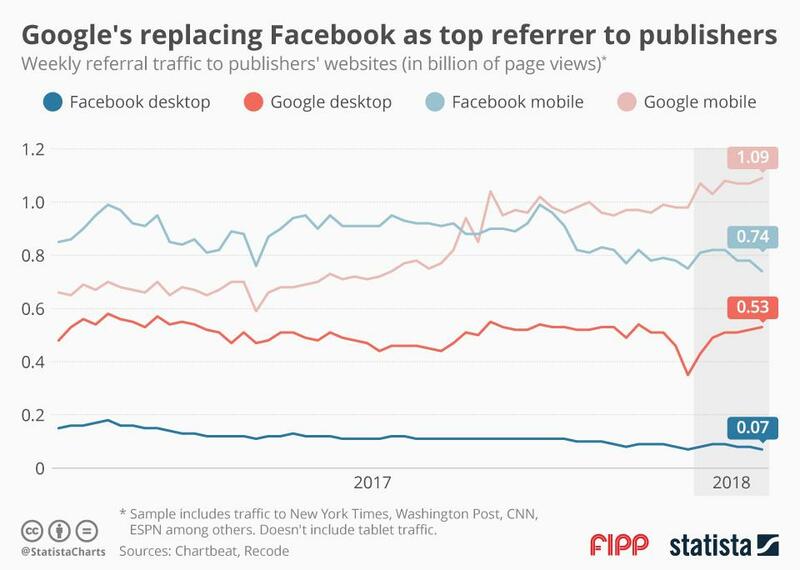 However, there are signs that the drop in referral traffic from Facebook is offset by traffic gains coming from Google searches, especially in the mobile section. Research by Chartbeat indicates that this phenomenon isn’t all that new. The below chart shows that Google mobile searches have closed in and overtaken mobile referral traffic from Facebook from August last year onwards. This is probably linked to the fact that “more publishers have been signing up for the Google's Accelerated Mobile Pages,” according to Recode. The AMP service hosts publishers’ content on Google servers, which reduces loading time for mobile users. The good news for the publishing industry is that Facebook referral traffic losses can be compensated. The bad news is that this doesn’t solve the overall problem of dependency on platforms. It might make publishers even more dependent on just one player.